This material is based on the extensive experience and lessons learned by the On the Cutting Edge project about running effective faculty professional development workshops. A great way to contribute to sustained faculty learning is to organize a workshop about content or pedagogy for colleagues at your institution or in your local region. These events not only help expose colleagues to new ideas but they also contribute to a convener's understanding of the issues as well. Below are some best practices that can make such professional development workshops more successful and impactful. Just like effective teaching activities follow directly from student learning goals, the activities of an effective workshop follow directly from the workshop goals. What do you want workshop participants to know and what you want them to be able and ready to do at the end of the workshop? Set the workshop goals early in the planning process and use them to select workshop topics and develop workshop sessions. Each session should contribute directly to meeting one or more of the goals. For each goal, ask "What could we do to ensure that workshop participants achieve this goal?" Just like learning goals, workshop goals need to be clear and assessable. Articulate your workshop goals in your workshop advertising (particularly on the workshop website if there is one) and at the beginning of your workshop so that participants know what to expect from the workshop. Research on learning shows how important active engagement is. Effective workshops actively engage participants and provide opportunities both for participants to learn from one another and to make progress on applying what they have learned in the workshop to their own teaching situations. Think of your workshop as a shared enterprise among conveners and participants, with a balance of workshop participants learning what research teaches us and sharing their own expertise and experiences. You can use think-pair-share, gallery walks, case studies, or many other active learning strategies to engage participants and model the effective pedagogies you want them to adopt. The conveners should facilitate the workshop, rather than teach the workshop. Give participants time to interact and share experience/knowledge. Presentations in concurrent or sequential oral sessions, poster sessions, and panels are good ways for participants to share their experiences, knowledge, and strategies. Unstructured social time is equally important and supports the development of networks that will last beyond the workshop. Also include time for participants to reflect and to plan how they will implement what they've learned. Reflection is an essential part of the learning cycle. Emphasize practical applications and ways to adapt materials. Participants are unlikely to adopt an individual activity or idea wholesale and are more likely to adapt an idea or use the idea as a catalyst for developing something on their own. Showcasing practical applications and strategies is an important aspect of effecting change. Also be sure that participants leave the workshop with specific plans for future action. Workshop time devoted to planning next steps is critical. If participants are also required to present their plans either orally or as informal posters, they are more motivated to develop concrete plans that they can use for more effective follow-through after the workshop. Such sessions also provide a mechanism for receiving feedback from other participants. Good workshops that appear to flow spontaneously reflect extensive planning by leaders, a clear understanding of the program and its objectives by everyone involved, and realistic planning for how long session activities will really take. If there are multiple conveners, knowing who is responsible for managing each part of the program is crucial. Those not running a session can help the one who is by keeping an eye on the time and making sure that program stays on track. The following examples of workshop sessions demonstrate the detailed nature of planning that pays off in the end. More examples are planned and will be added in the future. In addition to opportunities to provide formative feedback during the workshop, participants should provide summative feedback via some instrument before they leave the workshop. Once people leave, the likelihood that they will complete evaluation tasks is very low. Don't re-invent the wheel; take advantage of existing resources. 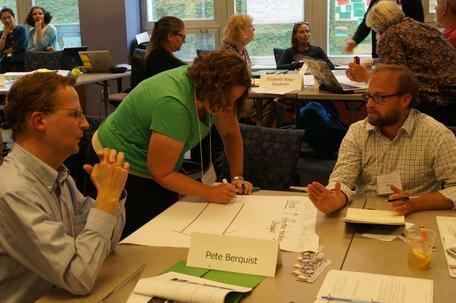 On the Cutting Edge: Professional Development for Geoscience Faculty: The On the Cutting Edge Professional Development Program for Geoscience Faculty brings together workshops, websites, and research activities to support high-quality undergraduate geoscience education. There are many examples of workshops tackling pedagogic or content topics, background materials developed ahead of those workshops, as well as synthetic materials built from the experiences of workshop participants. The site includes resources on managing an academic career, enhancing teaching, courses and course design, issues of program-wide significance, as well as other high-interest topics. National Association of Geoscience Teachers: The National Association of Geoscience Teachers works to raise the quality of and emphasis on teaching the geosciences at all levels. NAGT's purpose is to foster improvement in the teaching of the Earth sciences at all levels of formal and informal instruction, to emphasize the cultural significance of the Earth sciences, and to disseminate knowledge in this field to the general public. One particularly relevant program run by NAGT is the Traveling Workshop Program. The TWP brings national leaders in environmental, sustainability, and geoscience education to campus, regional, or national events and focuses on opportunities to strengthen both courses and programs including attracting and supporting diverse students. Building Strong Geoscience Departments: Through workshops, the website, professional society meeting sessions, and publications Building Strong geoscience Departments aims to stimulate discussions and disseminate community expertise on topics such as approaches to core content and curriculum, retaining and recruiting top faculty and students, and maintaining the department as a valued institutional partner.